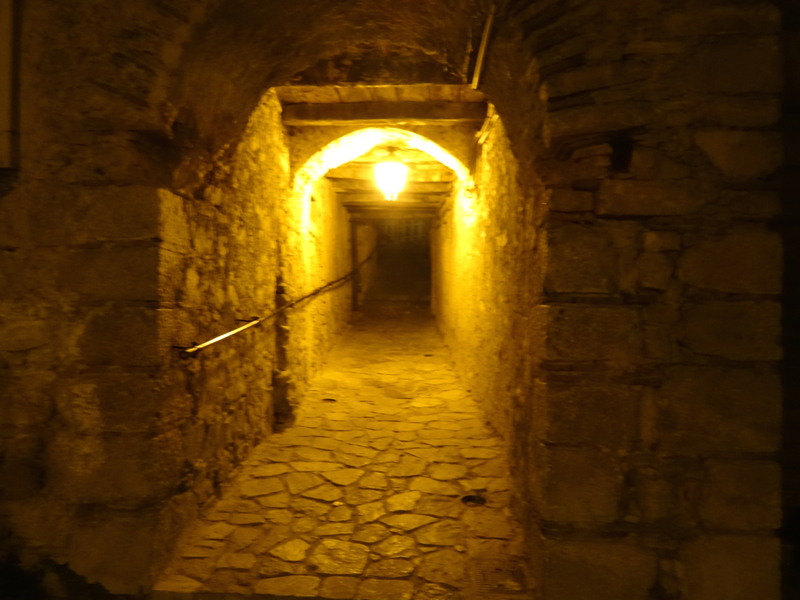 It takes little more than an hour to reach Roccagloriosa. Our route takes us through the small town and out the other side. The quiet streets are soon swallowed by countryside. 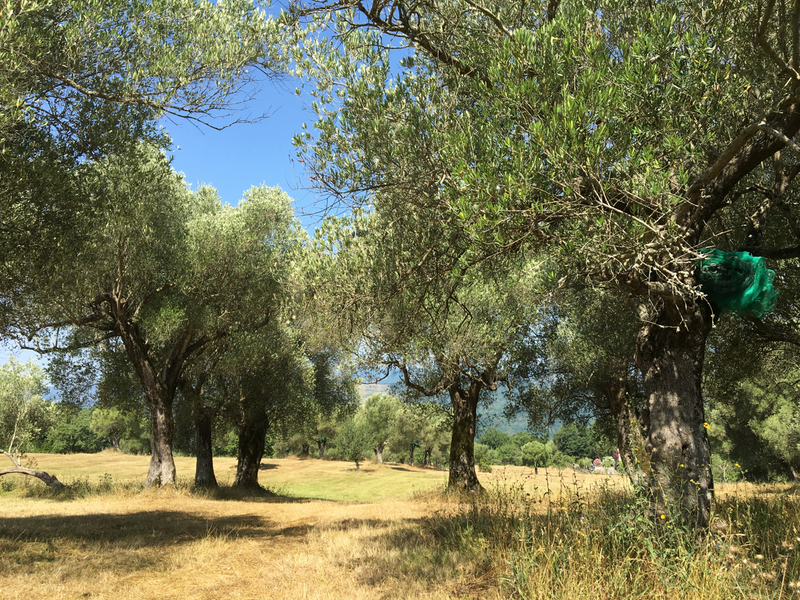 At first the road through the olive groves is unblemished Tarmac, but soon its hard surface is replaced by rutted dirt. Our aged Alfa Romeo, with its loose undercarriage, takes the track at a cautious limp. 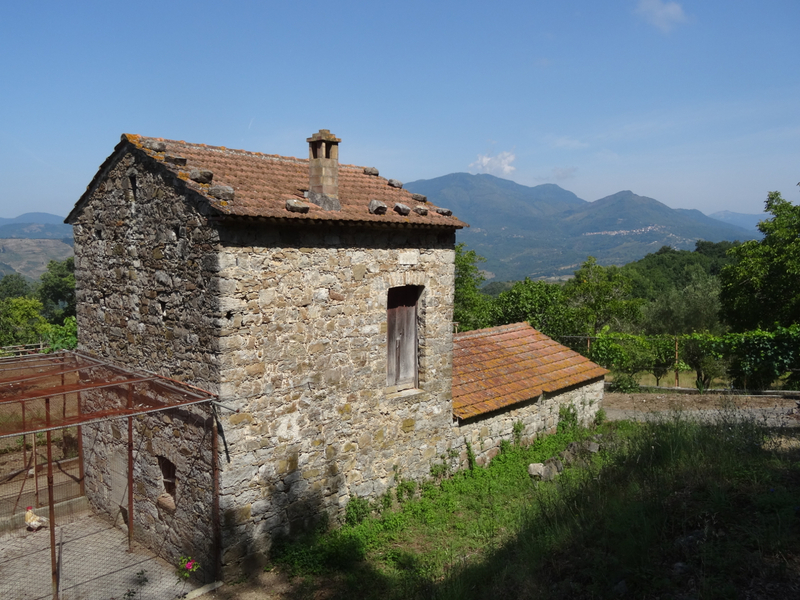 It’s a relief to see the sign for our farmhouse bed and breakfast – Le Stelle di Giurò. The spot, when we find it, is surrounded by wild woodland. 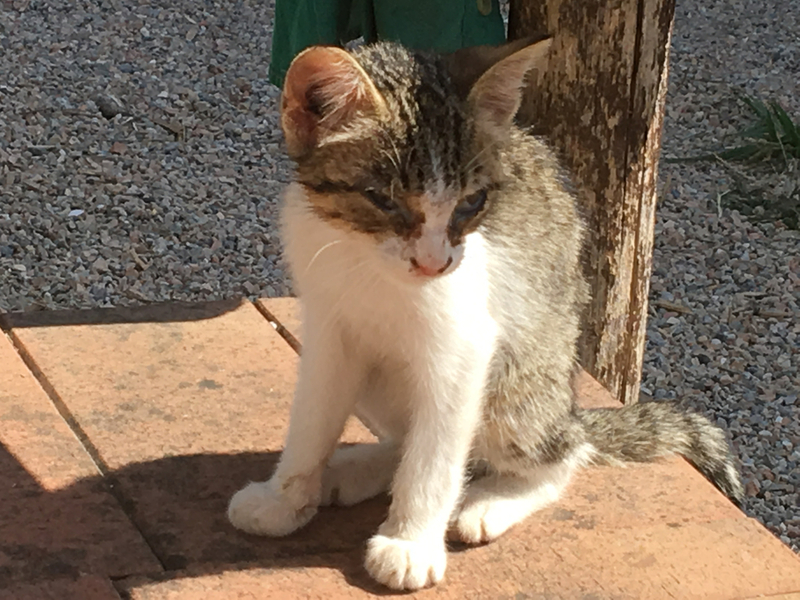 The owners, and an affectionate kitten, give us a warm welcome. The meal over we stroll the cobbled streets past doorway cats, and the chat of neighbours outside for the cool. It is nearly midnight and all is peaceful and still. 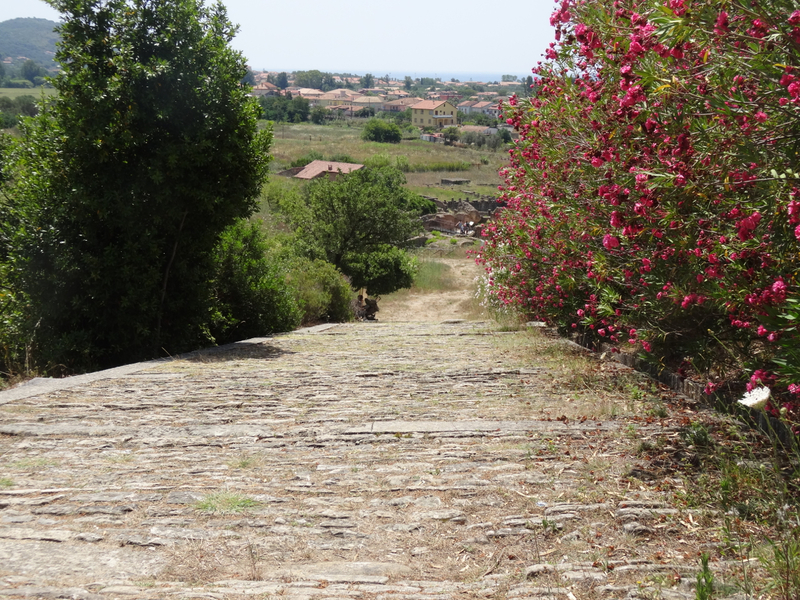 The next day after a comfortable night and a breakfast of delicious, freshly baked cakes and bread, eggs, ripe tomatoes, and coffee we turn back along the stilted roads towards Napoli. 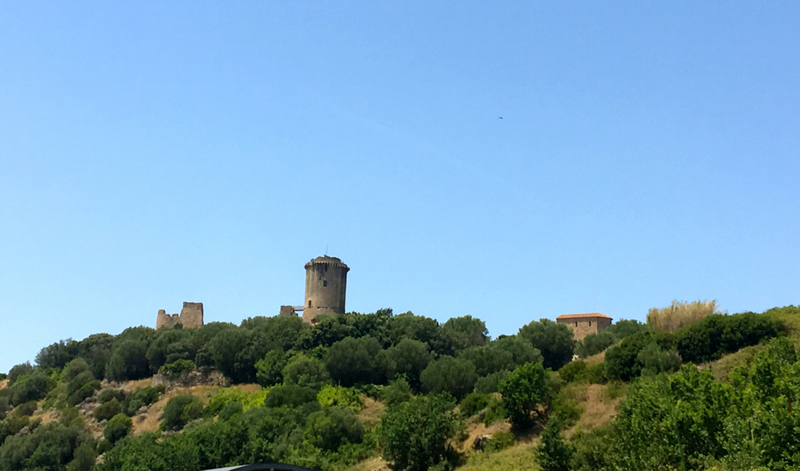 The plan is not to stop … but then the old site of Velia turns out to be en route home. We arrive just as the sun reaches the hottest part of the day. Shade is minimal, and the heat intense. 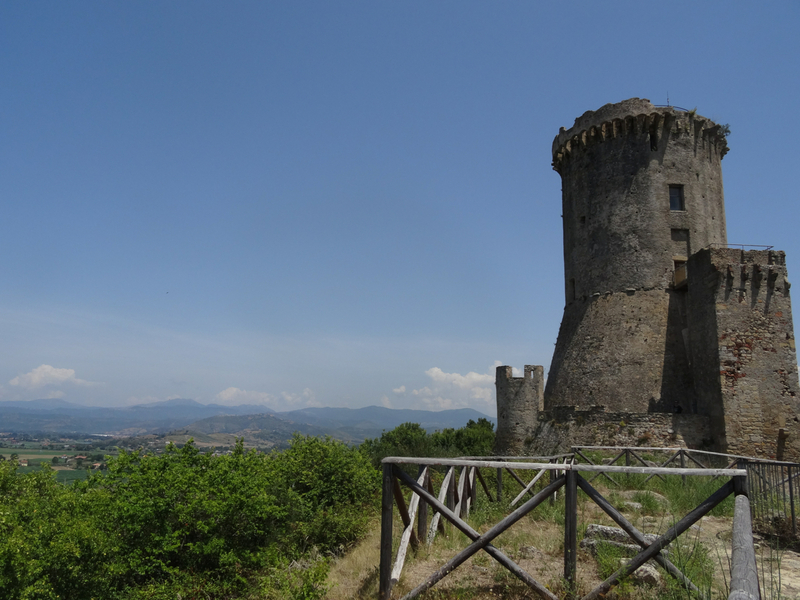 It would be sensible to abandon the mission but there is something about Velia … about its position high on the ridge, and the fact that it’s around two and a half thousand years old … and, like Naples, its founders were Greek. 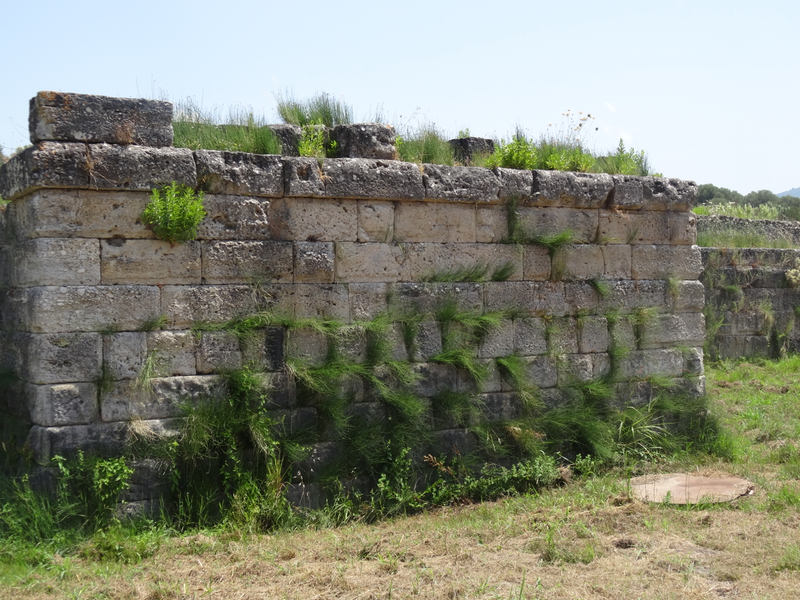 The Greeks brought their distinctive building techniques with them to Velia, and their schools of philosophy. The old centre’s location is excellent. 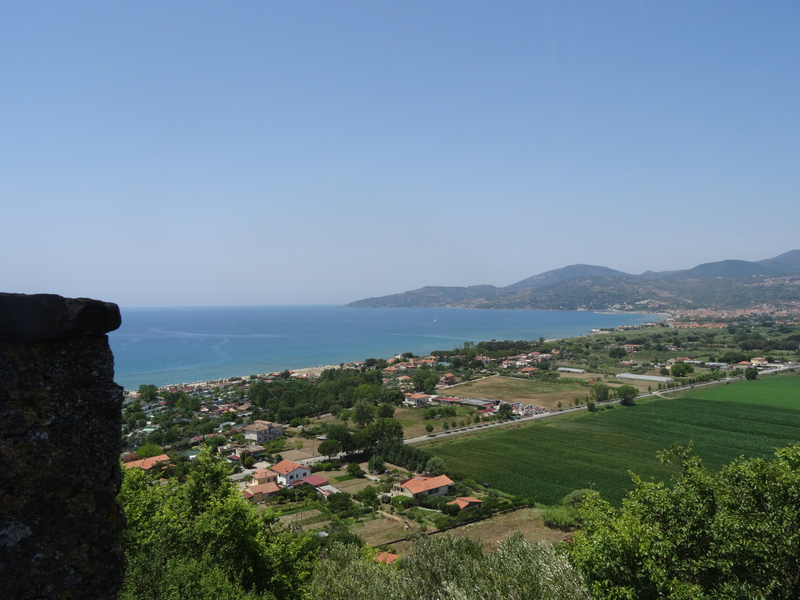 Elea (as the Greeks called it)/Velia (as the Romans called it), has views to the sea and to the mountains. The buildings, whatever their age, are built with care. Crowning it all is the site’s beautiful Greek arch. We trudge up the old road towards it. It is worth the effort. 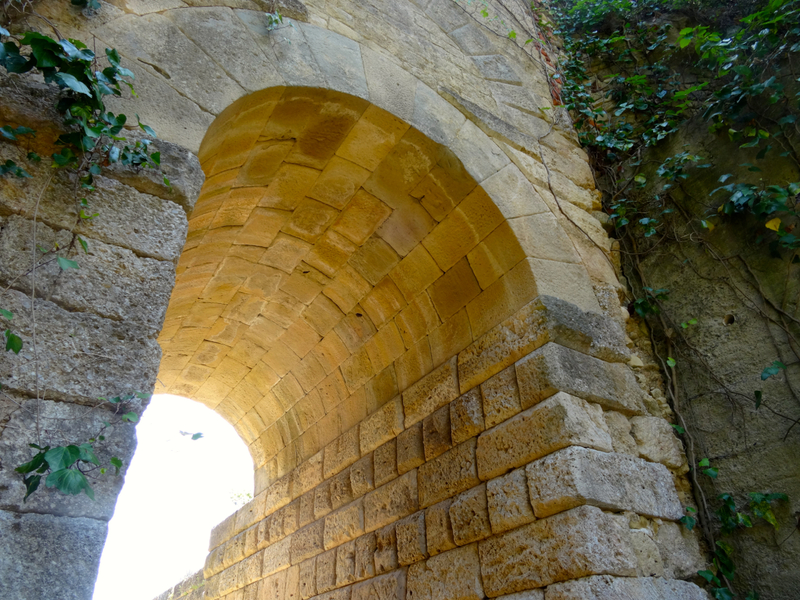 The arch (named Porta Rosa, after the wife of the archaeologist who recently uncovered it) looks as good as new. 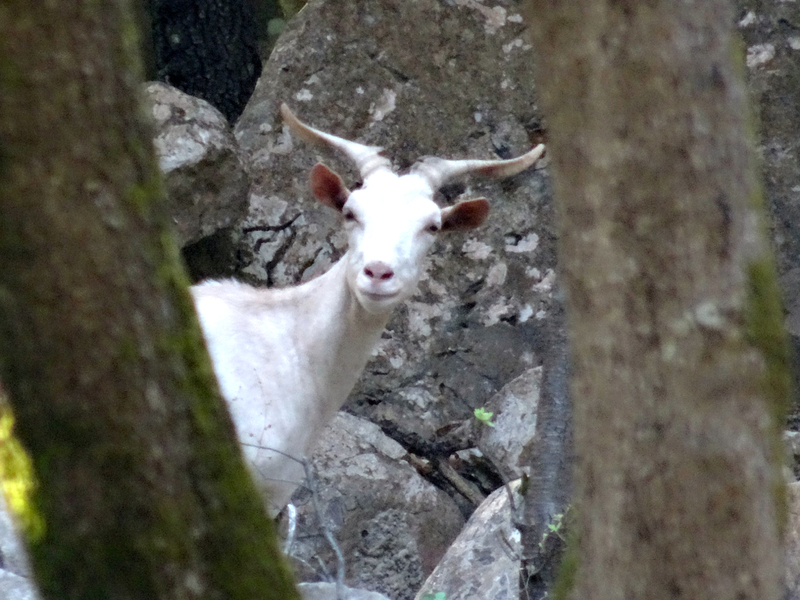 It sits in a gorge at the top of the hill exactly as it has done since the second half of the fourth century BC. The only difference today is that it is now without the debris that buried it for many centuries. 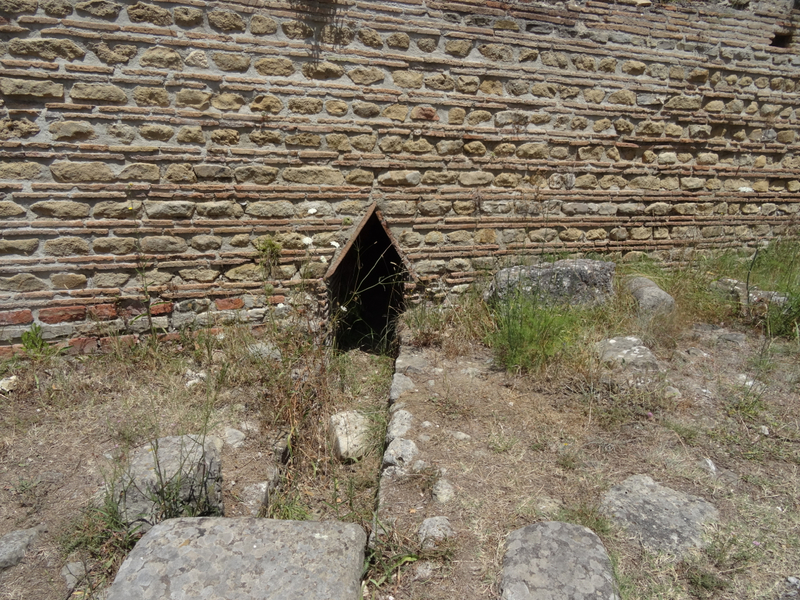 The rest of the site is a mix of Greek, Roman and medieval remains. Some of it is on top of the hill and some around the base. We decide, in a brain-sweat, to visit it all. There are other groups of visitors but there is never a crowd. 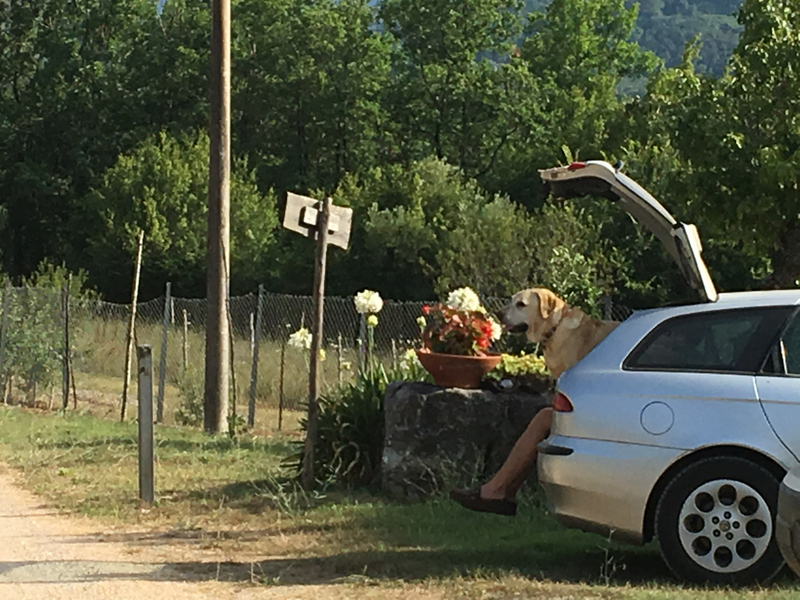 Most of the time it is just us, as we work our way from shade to shade, water fountain to water fountain, civilisation to civilisation, and view to view. 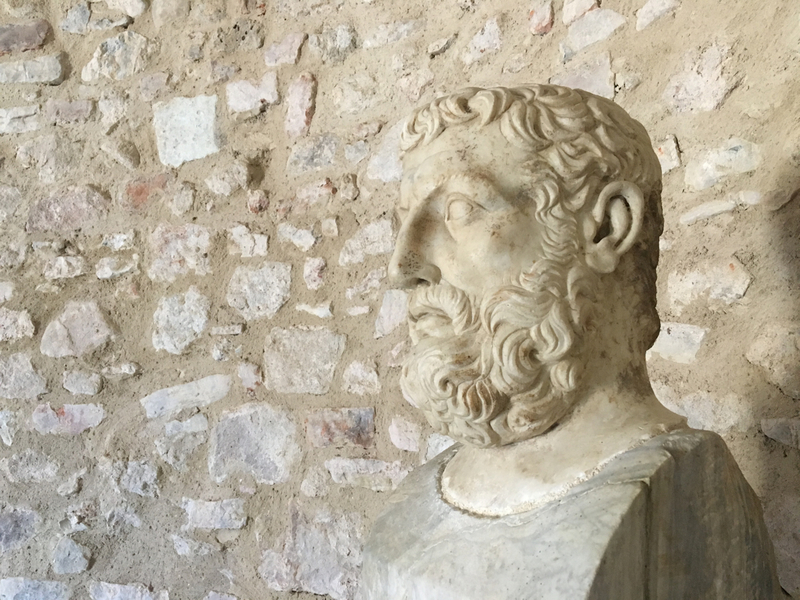 Up at the acropolis, right at the top in the shelter of a medieval building, we discover one of ancient Greece’s most esteemed philosophers – Parmenides (who lived around 500 BC) – and we learned of another who also came from Elea, Parmenides’s pupil Zeno (490 – 435 BC). The display is clearly laid out and easy to understand, apart from the quotation. We struggle first with the translation and then with understanding … “It is necessary to say and to think that What Is is; for it is to be, but nothing it is not.” Parmenides was not one to make thought easy. After a brief duel with the great thinker we make our way, still baffled, back down the hill to the car. We turn its nose towards Napoli, and the air-conditioning to maximum. It’s not the quickest of drives but our heads are full. 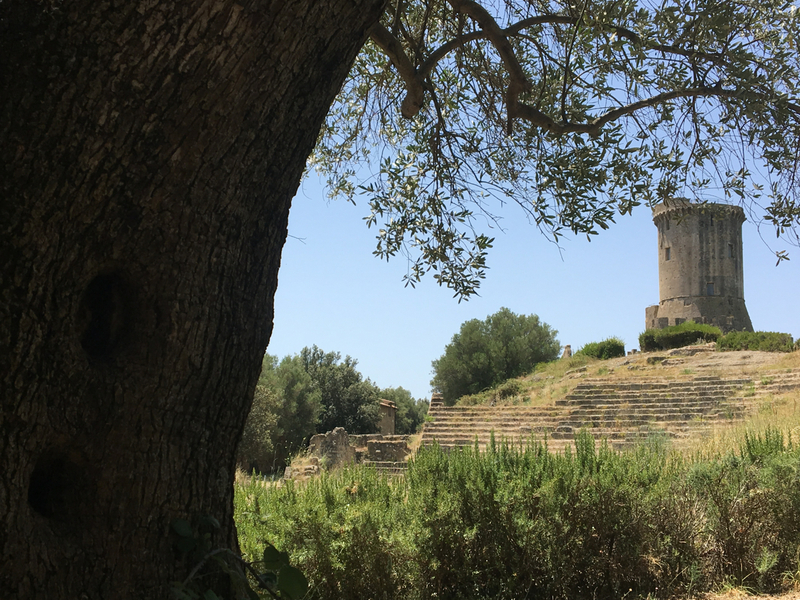 We have memories of sea views and wild places, of goat bells amongst olive groves, and of deep thought in the ancient home town of the impossible philosopher – Parmenides. It’s been worth every mile. 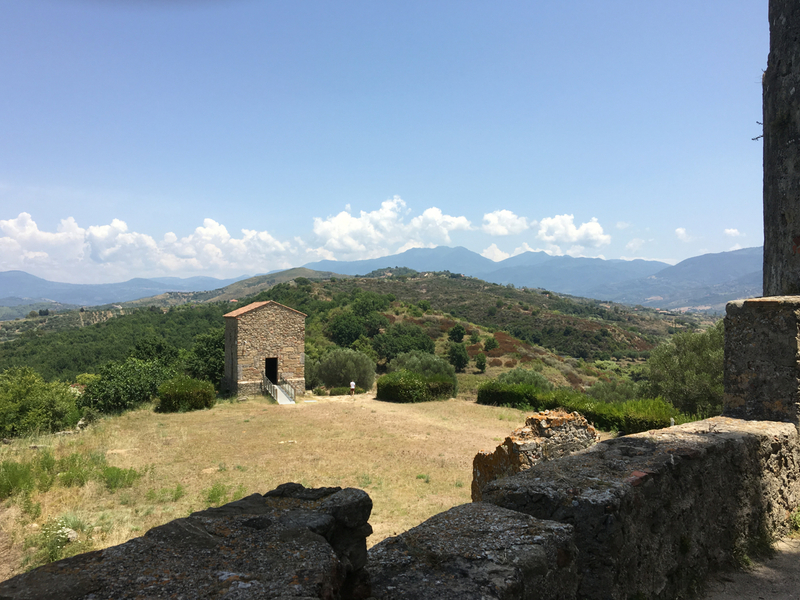 This entry was posted in Cilento, Italy, Velia and tagged Cilento, Italy, Le Stelle di Giurò, Parmenides, Roccagloriosa, Velia, Zeno. Bookmark the permalink. Thank you for this delightful post. 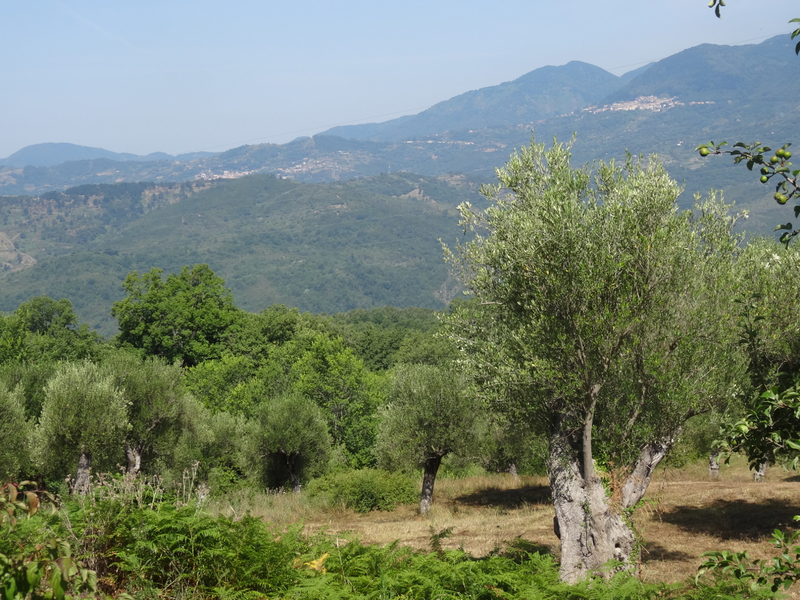 It has brought back memories of visiting the Cilento, where my father was from. Yet you taught me even more that I had already discovered. Thank you Antoinette – apologies for the delay in my response, my only excuse is a hectic houseful and an evaporation of time. So pleased you found this, especially since it is about an area you already know. 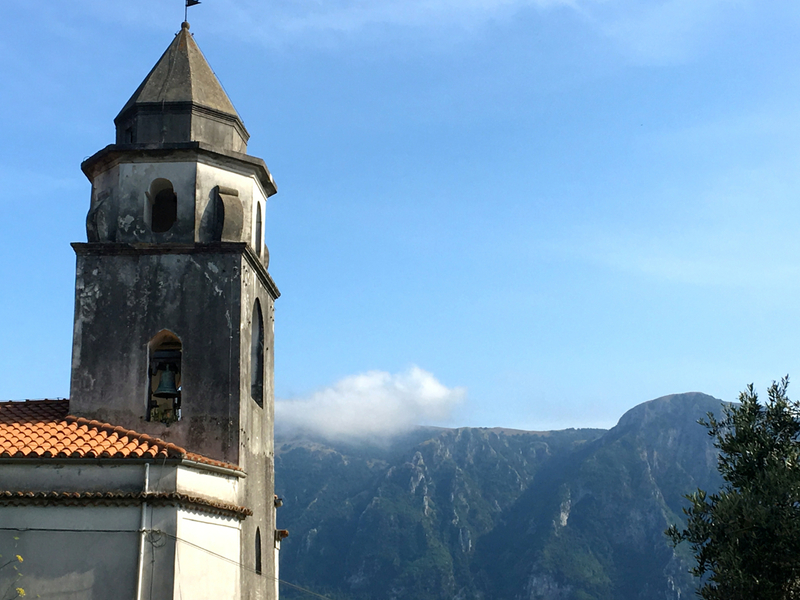 I really enjoyed reading this post about Cilento. What a delicious visit and food for the brain and senses. Sadly we never saw this area- a reason to return. I can feel the intense heat in your descriptions and can well imagine the lack of tourists at at such a prestigious site. As is the way with the cast number of sites in Campania. 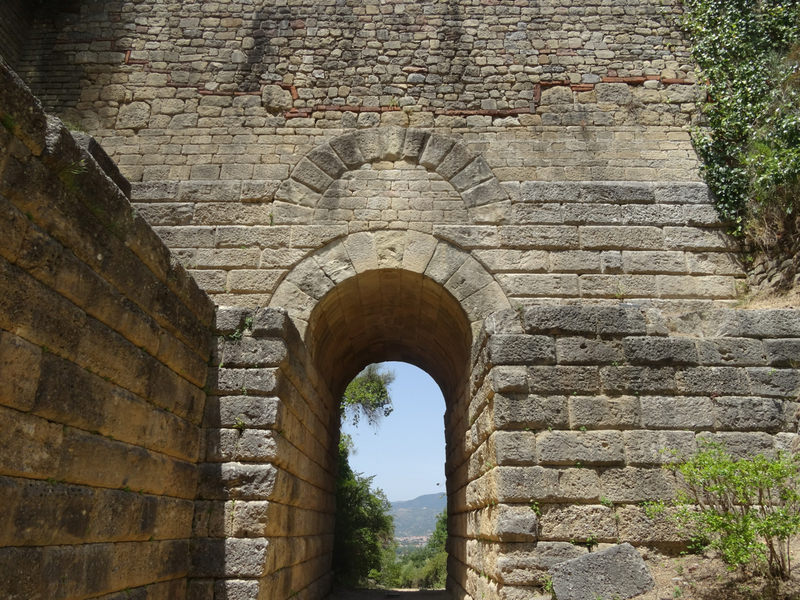 The archway was a marvel- a lost, past world, I could feel you stepping amongst the ancient ghosts. Gone, but clearly not forgotten in your case. Wonderful!